If you see the words “surrealist” and “exquisite corpse” and “alternative history” and immediately think dreamily of China Mièville, then this book may be for you. Mièville’s latest is The Last Days of New Paris and it takes place in an alternate version of Marseille that exists within a never-ending Surrealist nightmare landscape where Nazis and Resistance fighters battle it out eternally. 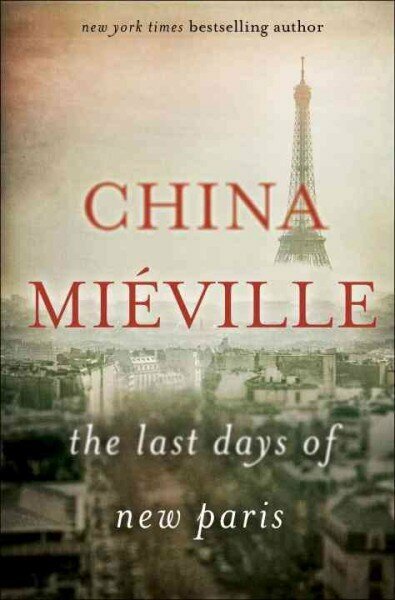 Now, first things first, let’s get my bias out of the way: I love China Mièville. Like when I picture perfection (and I mean this in a very broad way, not just writing), I picture him. But, I’m not going to lie, lately I’ve been feeling let-down by him. His most recent story collection, Three Moments of an Explosion, was amazing and wonderful and there was a story in there about magical playing cards and so I’m not talking about that book. However, his last novella, This Census-Taker was disappointingly flawed (though, I keep going back to it in my head. So maybe there’s more there that I need to go back to) and The Last Days of New Paris is equally flawed if, also, equally interesting. Mièville cannot be accused of not experimenting and trying new things, where so many other authors would not. There’s a lot to admire in TLDNP: from the incorporation of different Surrealist visuals to the way Mieville plays with reader’s perceptions of fact/fiction and the interchangeability between them in writing. Plus, there’s a Notes section, which is all I ever ask for anything. On the other hand, I wish there was more to love within these constructions. Of all Mieville’s books, this feels the most like an outline instead of a fully fleshed out novel. Some of that comes down to how he’s constructed it: the almost fragmentary and plain language in parts makes sense in context of the book’s “Afterword,” for example. However, it also doesn’t connect in the emotional way that I want it to: the characters read as far less realized than the art pieces that Mièville describes so lovingly. In the end, there’s a lot to admire here: the risk-taking, the fairly brilliant incorporation of the idea of what “exquisite corpse” truly means (I can’t wait to read a scholarly article on how the book itself acts as one, honestly), and the layering of the storytelling. However, this feels more like a book that’s important to read if you’re already a fan of Mièville, and want to get a full view of his writing and ideas, rather than for a passing fan or someone looking for an engaging, fantasy read. If you’re the latter, I’d suggest checking out one of his earlier novels, such as The City & the City or Un Lun Dun.